Here are 5 ways to add new life to an old ladder. 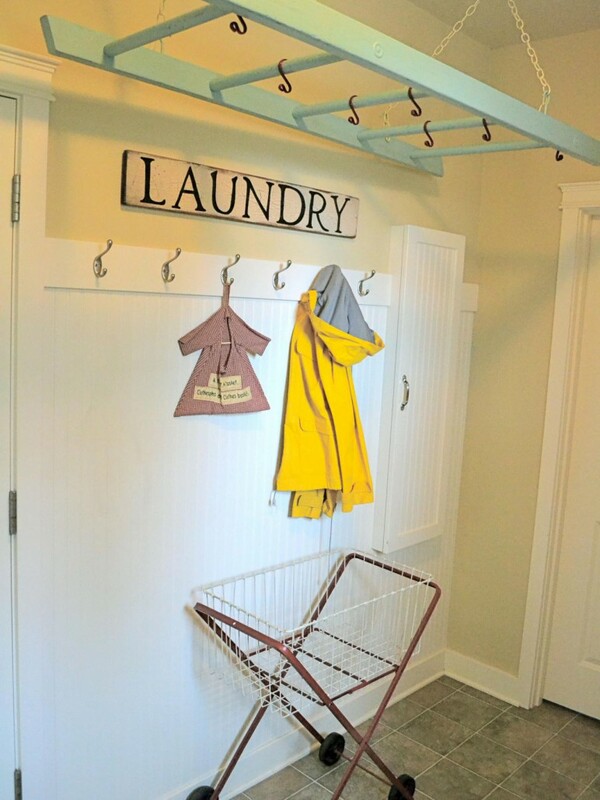 HGTV.com suggests using Rebecca Kuenzi’s method of using the ladder in the laundry room. Too many times, people will hang their clothes all over the place including draping them over the recliner in the living room. In a few simple steps, you can make a handy helper for drying laundry. With your “new” old ladder, saw it in half or two-thirds to make it shorter and fit the space. Next, lay the ladder down flat and screw four hooks into the top of the four corners facing the ceiling. Using chains, hang the ladder from the ceiling so that it is parallel to the ceiling. Then hang shower curtain hooks from the rungs of the ladder and hang your clothes on them for drying. Voila! Now you have a useful and out-of-the-way place to hang your clothes. Laundry Rack Photo from HGTV DIY home projects. What you may find at the local Habitat ReStore: Ladder, hooks, paint. Home remodeling specialist Bob Vila says to bring your old ladder to the kitchen. In your kitchen using the same method, hang the ladder from the ceiling and use it for storing pots. What you may find at the local Habitat ReStore: Pots and Pans, Utensils, Ladder, Chains. The folks at Real Simple make storing towels really simple with an old ladder. What you may find at the local Habitat ReStore: Ladder, Towels. A great deal of time and love goes into making a quilt. A Beautiful Mess, a woman’s lifestyle company, suggests creating a lovely, sturdy display using an old ladder. Quilt Rack Photo from A Beautiful Mess. What you may find at the local Habitat ReStore: Quilts, Bed Spreads, Ladder. Do you have more shoes than space in your closet? The team at Homedit.com has an answer for your troubles. Lean a ladder next to the wall and hang your shoes (and other items) on the ladder steps. What you may find at the local Habitat ReStore: Shoes, Purses, Scarves, Ladder, Jewelry. Enjoy these ideas? Subscribe to our blog and receive new ideas each week. Now it’s your turn. What creative ideas can you suggest for using an old ladder? Volunteer News: What’s Happening This Week with Halifax Habitat The Many Faces of Habitat Volunteers: It’s all Interconnected.